Winter is the sadly forgotten season and yet there is an array of fabulous colour in the plant world. Much of it free colour by that I mean we are not waiting for a flower. The light is low and rich tones radiate from the leaves and foliage comes in a multitude of shades. 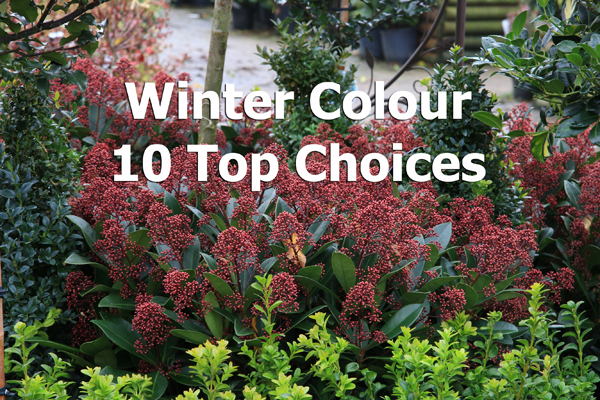 Red leaves, trimmed margins, variegated, some very interesting speckled shades where a virus have been introduced to change the colour as well as all variety of greens, silvers and yellows. 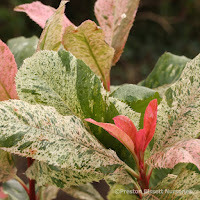 There are lots of new foliage plant varieties well worth a try. Just as technology moves forward the plant industry is rapidly breeding new varieties of interest. The Garden can be full of drama transpiring simply from frosted silver foliage with no effort at all. Silver evergreens are a gift to the garden. Silver foliage can disappear in bright sunshine on summer days but it really surfaces in winter and I wouldn’t overlook planting simple shrubs like silver Pittasporums and Euonymus jap.Pierrolina and similar foliage plants before we even consider a top ten of choices. As winter arrives and the leaves are lost on many deciduous trees and plants shapes can bring a wonderful quality changing the personality of space plants like a weeping skeletal silver birch or the framework of a twisted hazel and we also have berries until it gets cold and the birds get hungry. Here we have a top ten. Some are new plants you may not have yet come across. Mahonia is not new but on this list because it is so floriferorus in winter. Its hard to pick a particularly one as it depends on the size that will suit your garden and for that you have a choice. If you are resticted for space go for M.japonica Bealei and keep it prune to 1m. If you have oodles of space the M xmedia Winter Sun or Charity ,both are quiet similar at 1.5-3.5m would be your choice. These are evergreen and pretty shade tolerant plants. The new variety M.Soft Caress at 1m with much softer textured foliage is a great garden plant but flowers earlier ending in October. Mahonias have low nutrient requirements.They are shade tolerant and can be pruned throughout the year. They are quiet tough plants. This is another unique foliage which like the Fatsia japonica 'Siders Web' probably has a virus deliberately introduced to the leaf. A virus that will not damage the plant. Its Salmon silver tones make it a very unusual evergreen very different from good old 'Red Robin'. You will wither love it or hate it and the RHS judges did the latter. I think its quiet a fresh colour. At 175cm x 100cm it needs to stand at the back of the border and requires some partial sun. This is a very good evergreen.Nandina domestica has reddish-purple evergreen foliage intensifying in autumn and winter followed by blossom and berries (see the red berries in the banner), reaching 1.5m final height. The above listed are newer varieties with differences in their foliage. Bright lights has limey green tones and Twilight is speckled pink. Nadina foliage is hardy but it is quiet feathery so do not plant it in a wind spot. 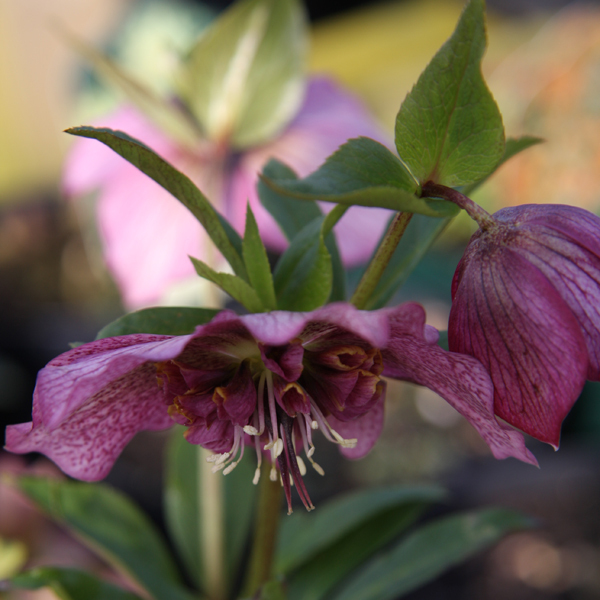 Both these new varieties have stock at the Nurseries this Spring. I love these unusual white berries. Skimmia needs a fairly neutral soil. They are hardy and great in winter containers. We are used to seeing the red berries particularly at Christmas and the male Rubella. I think this new variety stands out as a little special. These are evergreens grown in full sun or shade.Requiring a male for berries and can be pruned at about 1m comfortably. 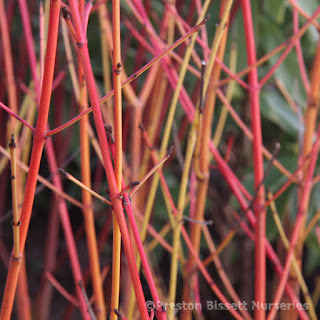 The fiery stems of the cornus have made my list. I particularly like the orange Mid Winter Fire which is a smaller variety and mixes well with the reds and green varieties for contrast. 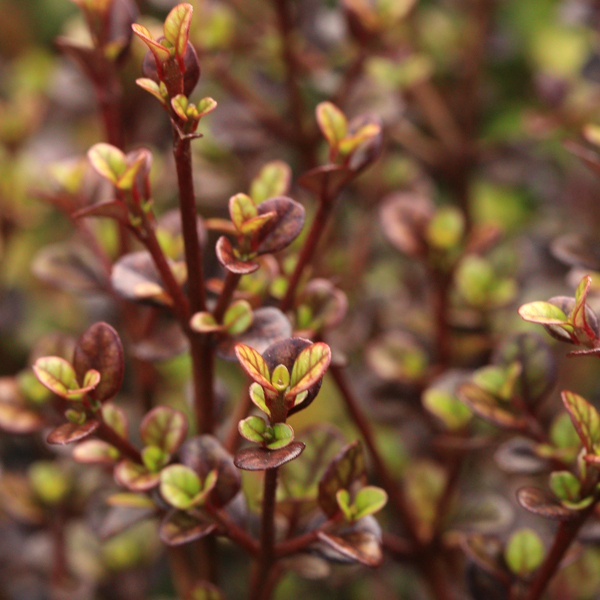 This is a plant to prune hard because the new shoots have the most intense colour. Helleborus Tutu..and .hybrid varieties..The Helleborus Gold series flower early and are usually white. Hybrid varieties are resilient, semi evergreen, with a good foliage cover for a lots the year and many flower above the foliage. Camellia sasangua series....Autumn flowering camellias in a range of colours. What could be better except to say they are out now.They are also more tolerant not so acid loving growing sucessfully in more neutral soil. 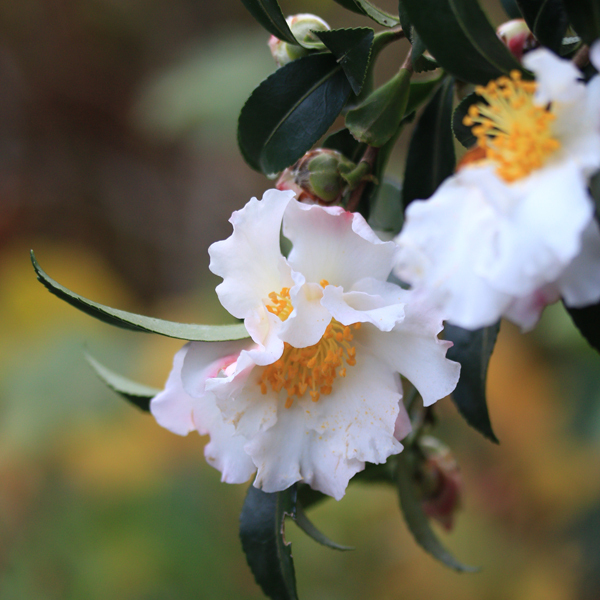 Known to us as a variety of myrtle and therefore to be grow in a sheltered spot or a walled garden. The foliage colour on these plants is lovely. There is delicate red ink veining. Betula youngii was shortlisted here as my favourite birch with its silver bark and sprawled stunted branches, ideal for a small garden.This prunus is here because its a beautiful blossom which is out in the milder spells right throughout winter. 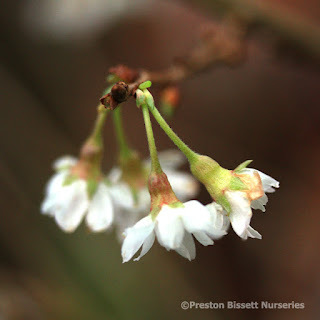 Its a small cherry blossom tree that could brighten up most gardens when there is a distinct lack of blossom. Look out for Viburnum bodnantense 'Dawn' a large shrub that also blossoms on bare wood. A fairy broad last choice and not a specific plant and so many evergreens can be shaped successfully but definitely a top choice for winter bringing both shape and structure to the garden. Topiary is a really good anchoring feature. It can help define the shape of the garden and draw your eye to where you would like to be focal, no flowers required. The cloud tree to the right adds sculptural interest making sense of the small border in front of a characterful cottage. 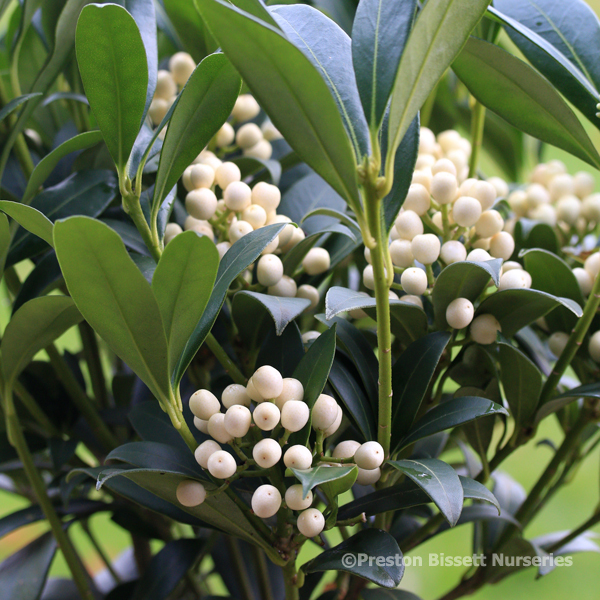 These types of plants also lend themselves to fairy light this time of year!